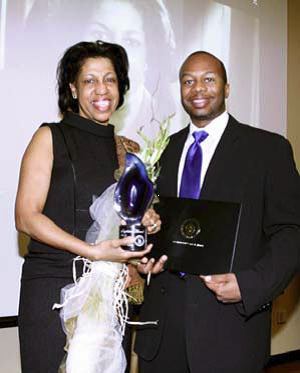 Photo from left to right: Teri Williams, President and COO, OneUnited Bank, (Sapphire Honoree – Business) and Eric Reese, Vice President, Omicron Chi Sigma Chapter of Phi Beta Sigma Fraternity, Inc.
President and COO of OneUnited Bank, Teri Williams, was presented with the prestigious Sapphire Award by Eric Reese, Vice President, Omicron Chi Sigma Chapter of Phi Beta Sigma Fraternity, Inc. during the fraternity’s Annual Tribute to Black Women & Sapphire Awards Ceremony on Thursday, February 28, 2013. Williams received the award in recognition of her dedication to uplifting the lives of members of her community in the area of business. The Sapphire Award is the highest honor given by the Phi Beta Sigma Fraternity to non-members who are making a difference in their communities in the areas of social action, education, and business. Williams was recognized for her commitment to supporting urban community members. In addition to overseeing the strategic direction of OneUnited Bank and managing the day-to-day operations, Williams is also the author of the financial literacy book for urban youth, I Got Bank! What My Granddad Taught Me About Money. Based on the financial principles from her book, she conducts financial literacy workshops across the country. Williams is dedicated to ensuring that people in urban communities have access to affordable, quality financial services. Under her leadership, OneUnited Bank has consolidated the names and product offerings of four banks to continue to support the economic development and wealth building of urban communities. She has worked in the financial industry for over 25 years serving in various positions for premier institutions such as Bank of America and American Express where she was one of the youngest vice presidents. After receiving a M.B.A with honors from Harvard University and a B.A. with distinction from Brown University, Williams served as Treasurer for Dimock Community Health Center in Roxbury, MA. The award ceremony was held at Northeastern University’s John D. O’Bryant African American Institute, Boston, MA. Phi Beta Sigma was founded in 1914 at Howard University by three African-American male students and now has more than 200,000 members worldwide with 700 chapters in the US, Africa, Europe, Asia, and the Caribbean. The fraternity is dedicated to building strong bonds of brotherhood, living with integrity, serving humanity, promoting quality education and developing leaders around the world.